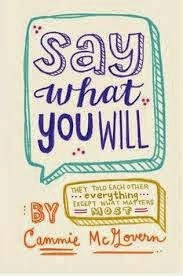 A few weeks ago I picked up the ARC of SAY WHAT YOU WILL by Cammie McGovern. The premise sounded interesting—a roller-coaster friendship/love story between a girl with cerebral palsy and a boy with obsessive compulsive disorder. Also it sounded…important. I could tell it was the type of story that would teach me something. I wondered if it would be difficult at times to relate to the main characters: Amy, who has a brilliant mind but is trapped in a body that won’t cooperate, and Matthew, whose mental disorder is sabotaging his life while he remains in denial. In fact, the characters were so relatable that I pulled a few late-nighters in order to continue reading. I really felt for these kids who needed each other so badly but didn’t always know how to communicate it. Their emotional growth was a beautiful thing to watch. In addition to their unique challenges, Amy and Matthew confront issues that everyone can relate to… loneliness and the intricacy of making friends, then figuring out which friendships are sincere and which will crumble in the wind. Dealing with social pressure and expectations from teachers, parents and classmates. Worrying about first jobs, first dates, fitting in and the way people perceive you. Agonizing over the choices you make—or don’t make—and how it all affects your self-esteem and your future. SAY WHAT YOU WILL can be categorized as a diversity book, offering a rare look inside the minds and emotions of people who are underrepresented and often misunderstood. But more than that, it’s a story about two people struggling to overcome their individual challenges while simply learning how to navigate Life. I’m really glad I read this book, both because it enhanced my understanding of the differences those with disabilities must deal with on a regular basis, and because it reinforced how similar we all are inside. Has anyone else had a chance to read SAY WHAT YOU WILL? What did you think?